This tea was generously gifted to me by Su as a wedding gift. Thanks so much for your generosity! Ripe pu’erh was invented in the 1970s, so this represents an extremely early specimen. The process has been tinkered with throughout the years so this humble tuo might show us a bit of how ripe has changed with time. On the subject of old tea.. It’s easy to find fakes that pretend to be something they’re not. Just search “ripe pu’erh from the 1970s or 1980s” on ebay.. All easily available and accessible with free shipping to boot. This very obvious fake has disturbingly sold over 251 times. Hell you can probably find some 1960s ripe pu’erh on ebay that predates the invention! I am typically highly skeptical of these sorts of claims. I also do not claim to have any special skill at identifying this tea’s age. So why this anonymous tuo from the “1970s” that’s not even from a major factory? In this case it comes from a trusted source and I trust its pedigree. And if this is indeed the real deal which I believe it to be, 1970s ripe pu’erh is something worth writing about. The tuo was stored in Malaysia. The tea has been stored cleanly and dryly, especially considering Malaysia is a relatively hot and humid place. The leaves are distinctly brown and not frosty in any way. 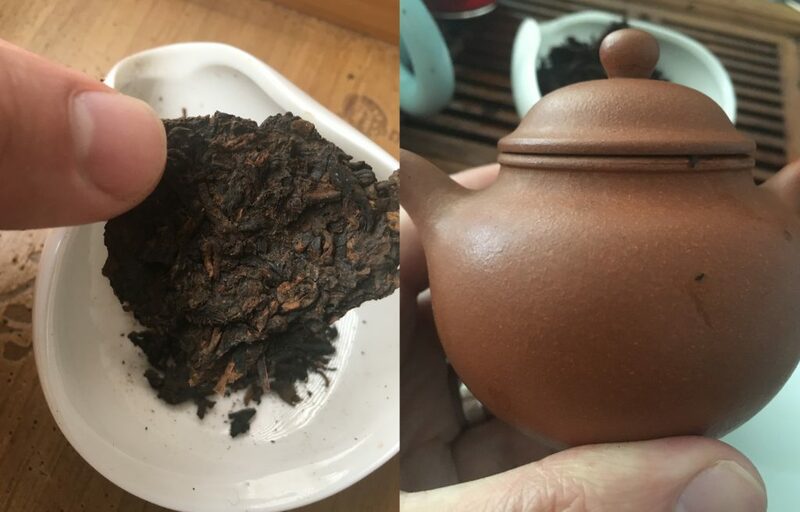 Protip: Don’t buy “old” pu’erh on ebay. I used 8.2 grams in a 135-140ml teapot. This is a pot I use regularly for ripe pu’erh. It’s one of my larger pots and pours a bit slowly. For comparison, I also brewed some 10-15 year old traditionally stored loose ripe that I drink regularly. These leaves are a little frosty. The profile is a very dark, ginseng, herbal brew I enjoy. Dry Leaf of 1970s Ripe Pu’erh & Pot. Sweet, some fruits, cream. A rich, date-like sweetness. Soft but not as soft as my more wetly stored ripes are or even heavily fermented young ones. A little oaty. Smells like a nice, moderate pu’erh. Darker, woodier than the first. Continues a bit with the creamy/fermented fruit. Moderate thickness. Sweet, coco wood. The taste is textured, layered and more complex. Here I really push the tea. It has a more interesting texture that is somewhat silky. It’s not as silky as a certain white, blacks, or old liubao get, but a bit more in that direction. It is also not as light as those teas. Comparison with loose ripe. The loose tea smells murkier, grainy, with a dark deepness, and cigars. Both brew very dark; the color is black with a hint of dark red. The loose ripe has a ginseng, herbal earthy profile I am familiar with. The 1970s has a similar thickness (maybe slightly less) and a more complex, higher, creamier, fruitier, and even rawer taste. The looser ripe contrast really lets me appreciate the 1970s as a refined experience. Sweeter than previous steeps. A bit of the cherry sweetness Denny notes sometimes. At this point the recurring themes of wood and some fruit sweetness remind me a bit of the 1997 7581. These are several minute brews. Creamy, vanilla, very smooth. Soft, some nice light silk texture. On later days. Pushed to varying extents of several minutes to 20+ minutes. These steeps are complex, creamy, full and enjoyable. The silk texture is also here. This is more of an interesting tea experience rather than a mind-blowing one. I enjoyed the tea, but unlike other teas featured here, this is not one I will be day dreaming about. The tea also performed in much more interesting ways when pushed very hard. The taste is more complex, and picks up a much better body, with increased texture and mouthfeel. If I were to brew this tea again, I would start at a more substantial brew times (say 45 seconds, steep 1). These older teas can be a bit of an adjustment to brew when you’re not used to it and I think I brewed too light at the beginning. Brewing hard you probably get a couple less brews, but the experience is much fuller and I’d rather get a couple great brews rather than a lot of OK ones. In a blind test, there is very little chance I would have guessed the age of this tea correctly. The storage is clean and dry. There is no ginseng that you get from traditionally stored ripe or any deep earthiness. I enjoy those wetter stored teas as well, but this tea is more lively and highlights different attributes. Compared to Su’s 1950s Liubao, this tea occupies a slightly higher range and doesn’t have the intense earthiness. The 1970s ripe also brews a bit longer than the also very old 1970s tea. The ripe also reminds me a little of a drier-stored ripe I’ve had, the 1997 CNNP 7581 that Yunnan Sourcing used to sell. That tea is loaded with date sweetness and a light smokiness. It’s active in a way that wetter teas are not. The taste here is different, but there are a few similarities. Interestingly, you can probably find ripes made within the last couple years that feel more fermented than this tea. Lastly, a couple unrelated thoughts on myself and ripe. A lot of ripe does get consumed by my wife and I but my own attitude towards ripe has me mainly buying as I go. Ripe doesn’t change terribly fast and if you are looking for a tea to transform and change with time it is probably best to mainly look at raw pu’erh. Late Steeps & Wet Leaf. This entry was posted in Aged Pu'erh, Podcasts, Ripe Pu'erh. Bookmark the permalink. Did u get the taste of chinese red dates? Thanks for the tea Su! Yes I think there’s some red dates in the tea, one of the notes I enjoyed with this one.